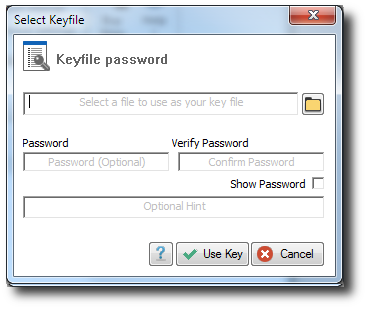 A Kruptos 2 Professional keyfile is a file whose content is optionally combined with a password. You can use any kind of file as a keyfile. The maximum size of a keyfile is not limited; however, only its first 2,097,152 bytes (2 MB) are processed (all remaining bytes are ignored due to performance issues connected with processing extremely large files). Any kind of file (for example, .txt, .exe, mp3**, .avi) can be used as a Kruptos 2 Professional keyfile however, we recommend that you prefer compressed files, such as .mp3, .jpg, .zip, etc. You do not have to use keyfiles. However, using keyfiles may improve protection against brute force attacks, particularly if your password is not very strong. Click the Use Key button. Your files will now be processed using your keyfile. When using a keyfile you must never change the contents of the original file as any changes made will result in a completely differently keyfile password being generated, note Kruptos 2 Professional does not change your keyfile.